and Paul Griffiths DL, Vice Lord-Lieutenant of Greater Manchester. The award, which was presented to Executive Chairman Martin Littler by Paul Griffiths DL, Vice Lord-Lieutenant of Greater Manchester, was for Innovation and was awarded specifically for ChooseIt! Maker 3, a cloud-based application that allows users to create, edit and play personalised learning materials. ChooseIt! Maker 3 is used in thousands of schools and homes around the world by parents, carers, teachers and therapists. In 2014 it won both a BETT and CODiE award. Welcoming guests to the event, Martin Littler paid tribute to the contribution of Oldham and the North West to the development of assistive technology over the last 30 years. Oldham was the location of one of two Ace Centres set up in 1983 and became home to the only surviving Special Education Micro-Electronic Resource Centre (SEMERC) after central government funding was withdrawn in 1989. The Oldham-based SEMERC later became Inclusive Technology as government legislation forced local authorities to privatise their commercial services. Anne Redmond, Executive Principal of Kingfisher School, also welcomed guests to the venue. Kingfisher is the only primary school in Oldham for children with complex and severe learning needs and is rated ‘Outstanding’ by Ofsted. Anne Redmond spoke of the growing numbers of children in need of specialist provision and of their increasingly complex needs. "We are very grateful to have Martin and Inclusive working so closely with us and for giving us the opportunities to help the children actually engage, not just in the learning at school but in their world around them." Guests were then treated to a new Kingfisher video (see above) introduced by the school’s Director of Creative Learning, Nicola Found. ‘Learning to Choose, Choosing to Learn’ showcases the use the school makes of ChooseIt! Maker 3. Found said Kingfisher’s close working relationship with Inclusive not only benefitted its children but also created professional development opportunities for its staff. Kingfisher is currently using Inclusive’s eye gaze software as well as ChooseIt! Maker 3 to enable children who otherwise would struggle to make choices to show what they can achieve. The video was followed by the formal presentation of a Grant of Appointment and a commemorative crystal bowl. 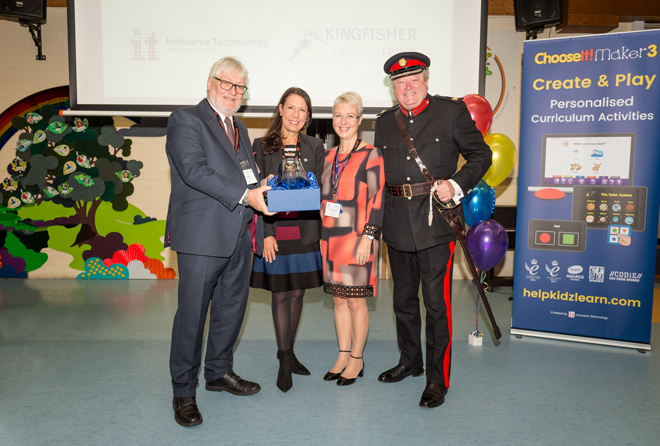 The Vice Lord-Lieutenant expressed gratitude to Kingfisher School for ‘the wonderful work that it does’. He explained that the Queen’s Award for Industry was initiated in 1966 and in 2002 it became the Queen’s Award for Enterprise. "It is the most prestigious award given for business performance and it recognises and awards outstanding achievement by United Kingdom organisations. The awards are presented in four separate categories. They are International Trade, Innovation, Sustainable Development, and Promoting Opportunity, which is a new category. The awards are made each year by Her Majesty the Queen on the advice of the Prime Minister who is assisted by an advisory committee that includes representatives of government, industry, commerce and trade unions. And as I said before these awards are very hard to achieve. This year only 57 awards for Innovation have been made across the United Kingdom —so it’s a very exclusive club. Six of those awards are in the North West of England, not just Greater Manchester but the whole of the North West, and yours is one of three in Greater Manchester —so it is an even more exclusive club. The award is not to an individual — and this is a really important point — it’s not even to the management, which may surprise you, it’s to the whole organisation, which is the way it should be. And it reflects the following: an organisation that has vision, creativity, sound management, good communication, and an enthusiastic and loyal workforce." The final speaker for the day was Debbie Abrahams, MP for Oldham East and Saddleworth and Shadow Secretary of State for Work and Pensions, who expressed her pleasure at being back at Kingfisher School. "It’s a particular pleasure to be here this morning to congratulate Martin and all of his team at Inclusive Technology. Some of you may know that at the Kingfisher fundraising ball earlier this year Martin was the lucky winner of a prize to come to the House of Commons and we had tea together. It was the first time we had met and I was absolutely amazed at the work that Martin described." Debbie Abrahams explained that her Shadow Cabinet brief includes disabled children, hence her interest in assistive technology. She also commended Inclusive’s decision to make some of its software freely available to developing countries worldwide. "We think we have dwindling resources - and we do - but compared to some of the countries Inclusive Technology has made its software available to, it’s nothing. That really, really epitomises the company." The speeches and presentation over guests were invited to see Inclusive’s range of resources being used in Kingfishers’ classrooms before enjoying a buffet lunch. There was a final unexpected announcement, however. While the event also marked Inclusive’s twenty-first birthday Martin Littler made known he would be standing down as its CEO at the end of October although he would remain involved as non-executive Chairman. Leadership of the company now passes to Managing Director, Sukhjit Gill. 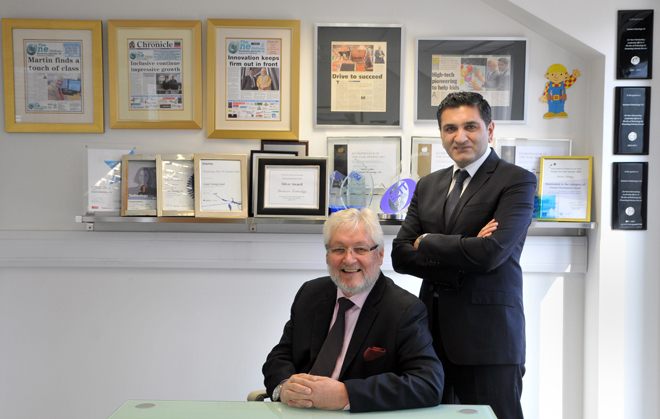 Martin Littler, Executive Chairman and Sukhjit Gill, Managing Director of Inclusive Technology. "Martin, Trish and Roger, the founders of Inclusive Technology, started with a mission to deliver innovative technology to make a difference to the learning of students with disabilities. They have managed to do this for the last 21 years, which is a phenomenal achievement. The new management team at Inclusive aims to continue building on these foundations, harnessing new technology with students central to everything we develop and deliver. Technology is moving faster than ever and we feel so excited about the future and the difference we can make." Martin Littler also remains a member of the board of the US-based Assistive Technology Industry Association, a member of pdnet’s Expert Advisory Board, and will represent Inclusive as a founding member of the All Party Parliamentary Group for Assistive Technology.